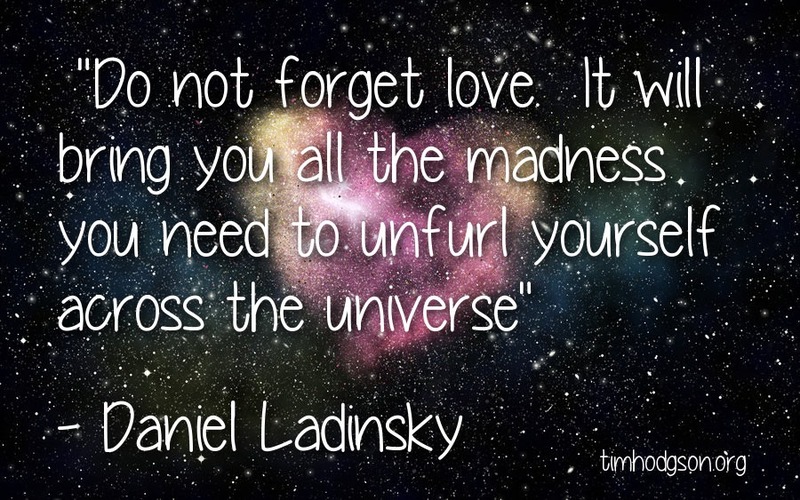 Over and over again I find myself coming back to this quote from poet Daniel Ladinsky. There is a beauty to it, but also a rawness to it, and a sense of unstoppable magical power. Sometimes, we need to rediscover madness to step forward. A sense of craziness, a personal insanity that draws us past what makes sense, what seems logical. Sometimes we have to step beyond what we can see, or what we can think of. Sometimes, all our pondering and planning needs to take a back seat and we need to let our hearts do the deciding. Because our heads just aren’t equipped to understand what our hearts can naturally intuit. And so we need to let go of what our thoughts tell us – that manic maelstrom of pros and cons, for and against, extrapolations of the future – and simply let our hearts say ‘yes’. Love doesn’t make promises of safety (although you always are). Love doesn’t guarantee success (although you might be surprised to find what ‘success’ really looks like). Love doesn’t always lead us down paths that make sense (although looking back, they will). But what love does promise is that this is what you were made for. This is the adventure of your life. And always – always – love is leading you forward into your greatest ever life. One day, 13 ‘interesting’ years ago, I faced a choice as to whether to remain safe and secure in my hard won and well remunerated technical career, or to step out into a new world, a new adventure, full of uncertainty and danger, yet something I knew my heart was calling me to. I faced the choice – stay safe in harbour or run before the winds of the universe. I would like to tell you that it has been easy. Those close to me know that it has been anything but. It has been a wild ride. A perilous ride. But it is the adventure my heart longed for, and I know that, as Hemingway put it, I have become strong in the broken places. And, looking back, it was the adventure I needed to become who I needed to become. “Maybe your inner sight is clouded by the opinions of others, or the horror stories of your inner lizard. Maybe you’re sundazzled by a perfect looking surface, projecting the trappings of an enviable success and hiding the sense that you’re lost, directionless, hollow. Maybe life has given you a chance to walk into the darkness, and you’ve been staring terrified at the ground in front of your feet, trying to see your way by following your way to some well-beaten path. And maybe – quite likely in these days of dizzying change and unprecedented possibilities – no beaten path exists. If you’re reading this and wondering whether to throw yourself into the adventure your heart is drawing you into. then by all means check whether this is the insanity of infatuation or the stirrings or crazy passion. And then look deep into your heart and let it draw you onward. As Joe Campbell observed: “If you go into the forest where there is already a trail – you’re not on your own path.” Find yours. Find the path only you can walk. It takes a certain madness to leap. It takes a certain craziness to leave the well trodden safe path in search of true meaning. But when that madness is driven by a profound sense in the depths of your being that this is where love is taking you.. then jump. And you will be born on great winds across the sky. This entry was posted in Dreams, Love, Poetry by Tim Hodgson. Bookmark the permalink.